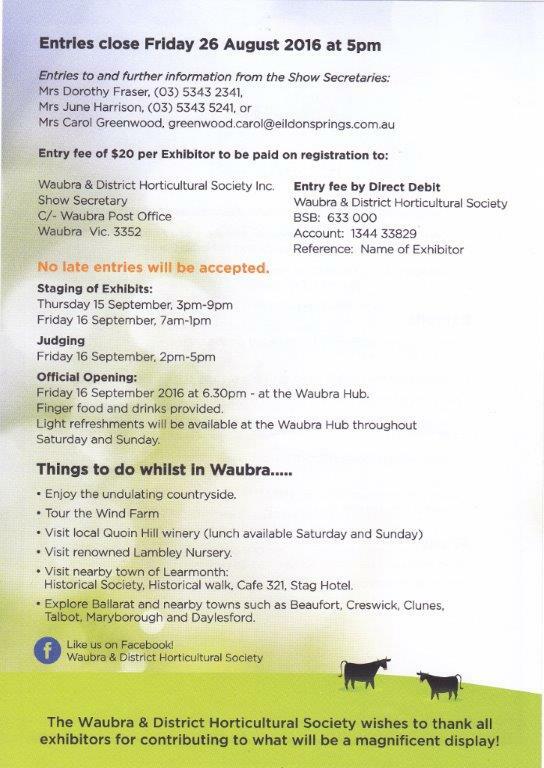 Waubra Horticultural Society is re-vamping its spring show to broaden its appeal and the diversity of entries it recieives, particulalry in a regional and statewide context. 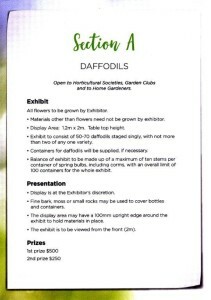 The show, to be held over the weekend of the 17-18th September will feature a focus on daffodils and floral art, with significant prize money for these sections. 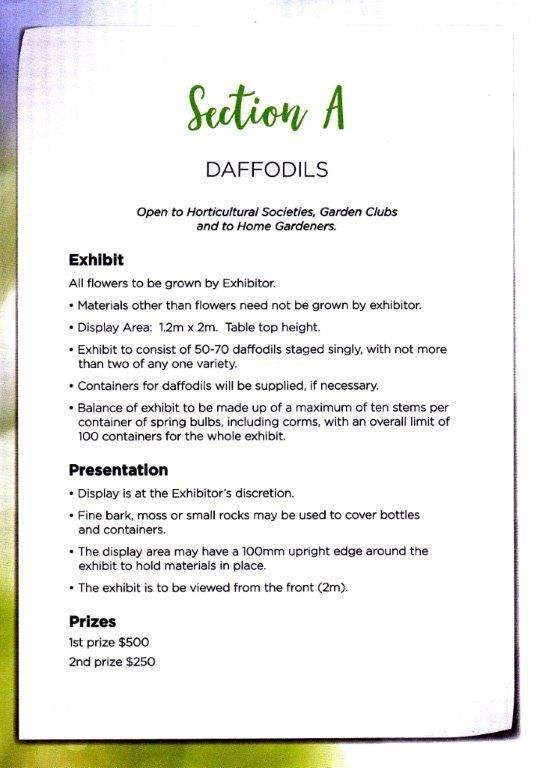 “We hope to make the show a major feature of the calender for all the garden lovers from Bendigo, Ballarat, through to Colac as well as from Melbourne to Horsham”, Mr McDonald said. 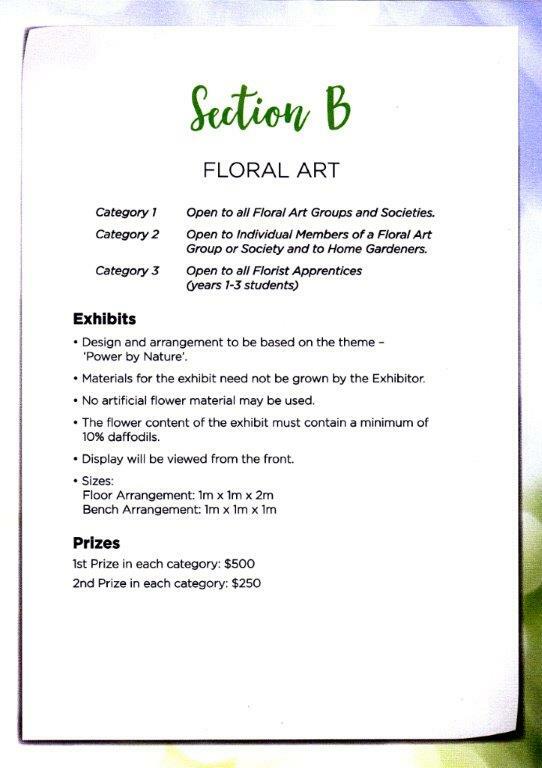 Both individual and team entries are welcome and there is a special emphasis in the event for young up and coming apprentices in the floral art space. 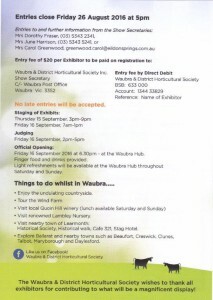 Please find attached the flyer from the Waubra Bowling Club for their barefoot bowls evening on Friday 28th November. 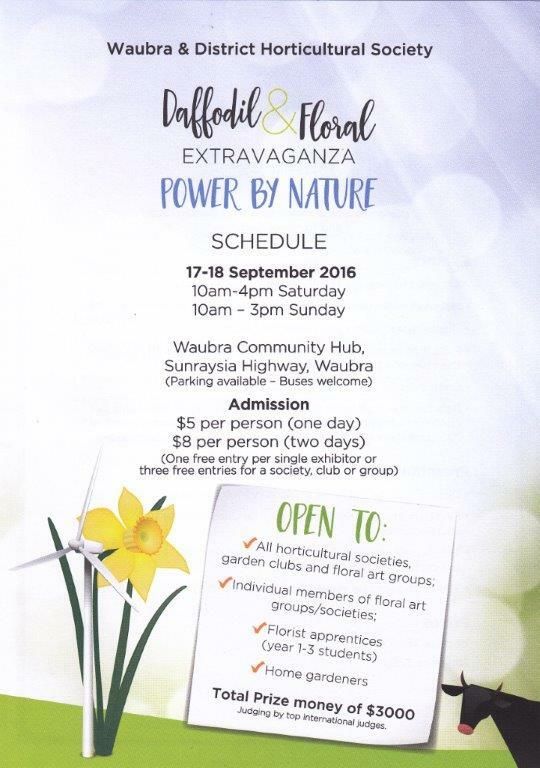 See you there “without your shoes on”. 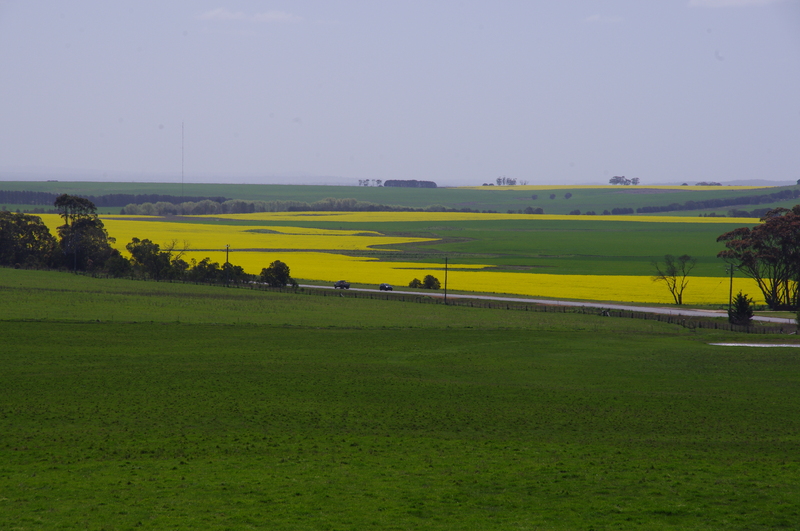 The season is finishing much dryer than anticipated, however many crops are still looking good. Some rain this weekend would be a fantastic outcome. 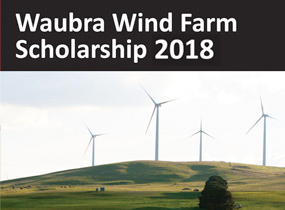 Please find attached details for the Waubra eduction scholarship sponsored by Acciona. Last week end the club was busy with the Junior Presentation Night on Friday, two netball teams playing on Saturday and two footy sides on Sunday. The Junior Presentation Night had a huge turn up with approximately 170 people attending, we hope you all enjoyed the night. Once again congratulations to every player who received a trophy that represented Waubra this year and well done to our award winners with Dylan Hinchliffe winning the B & F from Runner Up in Samuel Cashin. Leading Goal Kicker Jaden Hande, Most Improved Jimmy Muller and Coaches Award Jayden Severino. The Junior Clubman Shield was awarded to Mitch Harrison. The conditions were great on Saturday with C grades girls getting off to a good start in the first quarter against Hepburn and were able to hold their lead for the remainder of the match. The B grade girls had a tough start against Learmonth, neither side could get ahead. As the game progressed Waubra was able to get on top and hold on to win the match. Both C and B will play Springbank this weekend, with the C grade game kicking off at 12:30 and the B grade game following. The reserves got off to a good start against Springbank last weekend, but they came back at us in the second quarter. The boys then settled in and had a good win over Springbank. This weekend they face Bungaree and are planning to make it back to back premierships, the midday show kicks off at 12:30. Last week the senior boys came up against Springbank, who got off to cracking start, with accurate kicking they had an impressive lead on us at quarter time. Our guys were able to slow the scoring, but were unable to make up the deficit. Come along and support the netball and football team who have made it through to the grand final and to celebrate the successful season that the club has had. SATURDAY NIGHT – Everyone is invited to come and celebrate our season at the club rooms. There will be entertainment at the HUB, a bus will be leaving the Blue Bell at 5pm and return at about 12:00, tea will be available. SUNDAY – Netballers and footballers are encouraged to come and spend an afternoon at the club. 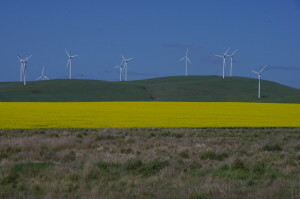 A bus will leave the Blue Bell at 11:00am and return to Ballarat at 5:00pm, there will be a BBQ lunch available. SENIOR PRESENTATION NIGHT – The Senior presentation evening U17 and above netball, U17.5 and above football is on Friday 19th September. At Miners Tavern (120 Lydiard St North) from 6:30-12:00. Tickets aren’t available on the night. The dress code is semi-formal (no demin) and it is an expectation that all players attend. Thanks to everyone who has contributed to another successful season. 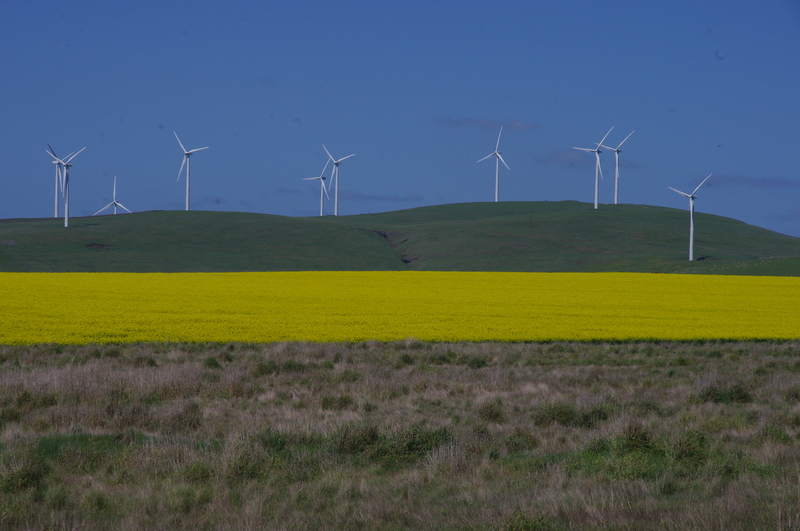 As the final step in Australia’s successful move to digital-only TV, some free-to-air channels in Ballarat and surrounding areas in western Victoria will change frequencies on 17 September. After channels have moved, viewers will need to retune their digital TV, set-top box or digital TV recorder. For most televisions this will be an automatic process similar to tuning your television for the first time upon instillation. Good luck to our two netball and two football teams who are in preliminary finals this weekend. To have 4 teams is a terrific effort and no matter what the result is you have all represented the club well and should be proud of your achievements. Last week our A grade netballer’s came up against a strong Skipton team and although we tried very hard until the end we were defeated by a better team on the day. Our C grade netballers played against Rokewood and had a terrific game coming away with a great win. Sophie Cullinan had a fantastic game in goals and now the girls come up against Hepburn for a spot in a grand final. Our B grade girls were lucky enough to have the weekend off and today play against Learmonth as well for a spot in a grand final. Our senior and reserves footballers were lucky to have the weekend off after good wins in week one of the finals and both teams are up against a strong Springbank team. Senior football and netball (under 17, C, B, A grade netball & 17.5, reserve and senior football) will be held on Friday the 19th September at Miners Tavern in Lydiard street Ballarat. Cost is $40 for adults and $25 for under 18 and includes a two course meal and DJ entertainment from 6:30pm. Tickets must be purchased ONLINE before the event as no tickets are available on the night. 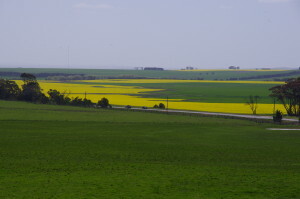 Woodside is a substantial grazing property situated between Talbot and Lexton. Rambling gardens complete with meandering creek surround the homestead. In Spring of this year the gates will open in a rare opportunity for visitors to explore and enjoy the extensive county gardens. 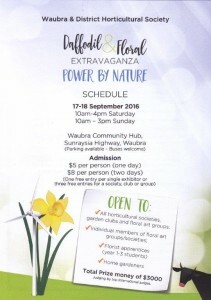 The Woodside Open Garden Day is a family friendly fundraising event by the Waubra Kindergarten, Waubra Primary School & Evansford Community Centre, together with the support of the property owners. • Live music by local band Kevin Antonio Alive & Kicking. • The secret garden storytelling corner. 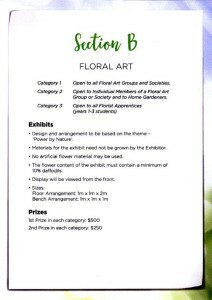 • Nature art & craft station.